Where Better To Store Your Earbuds Than On a Pair Of Ears? Tired of spending ten minutes unraveling your headphones like they're a MENSA puzzle when you take them out of your pocket? 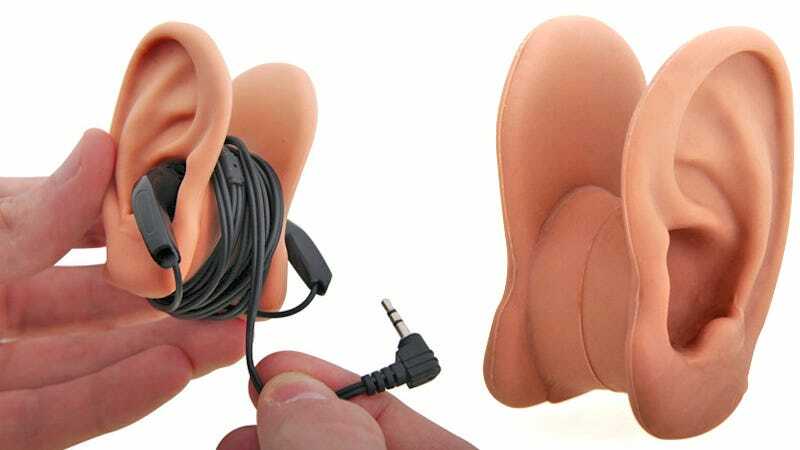 Then you need a cable wrap, and what's more apropos for storing a set of earbuds than a disembodied set of ears? They're made from soft silicone so you can actually stick the 'bud' end of your headphones inside each ear, and then wrap the remaining cable around the bridge that connects them ensuring they'll be untangled the next time you need them. There's no word on pricing or availability just yet, but we'll keep our real ears to the ground and let you know when you can order a pair.